“Opportunity to experience another world”. Creative Connections brings art and poetry together, but not just any art, it is an exhibition of paintings by differently abled people in big, bold colours – a microcosm of their lives and feelings. Here are abstracts that would enhance any living room. And yes, the paintings and poems are for sale, 90% of the proceeds going to the artists. An annual event, the Creative Connections exhibition has previously been held in suburban shopping centres. 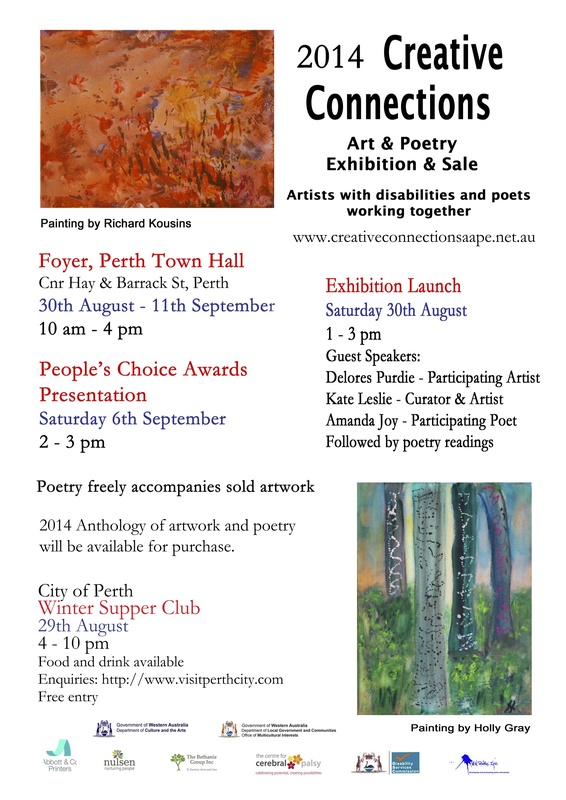 This year, however, we are to be located centrally in Perth’s Town Hall Foyer, from 30th August – 11 September, 10 am to 4 pm. Do visit and browse in your work lunch hour or for a welcome pause in shopping. An anthology illustrating this year’s artwork and poetry will also be for sale.